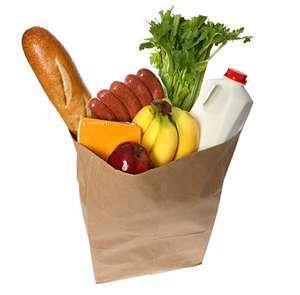 What you need to take to the grocery store is CASH. Cold, hard cash. And if you’re the type that embarasses easily, you might want to take a calculator. Cash changes things. When you know you have $14.00 to spend, you can make some amazing choices. You’ll put back the Doritos and grab the tortilla chips. You’ll look for the sale items and put the generics in the cart. You’ll use coupons and ask the clerk to price match the sale ad. Cash puts a ceiling on your spending that plastic won’t. Cash says NO. Don’t be embarrassed to tell the clerk you need a subtotal. Don’t be afraid to put a couple items back if you’re over your cash limit. Bet you thought I was going to tell you to take your recycling bags. Nope. Loveliness is an essense. An aura of beauty and confidence and strength all swirled together like Grandma’s yummy chocolate cake. Loveliness is internal. Sound stuck up? Maybe. But I don’t think so. I think there’s something so amazingly lovely about knowing what’s good about you. In not being mired down in all the inadequacies and shortcomings and being able to focus on the good stuff. When you do that, you create an aura of confidence that’s hard to find anywhere else on the planet. We all know what a To-Do list is. We make the list. We check or cross things off. We feel happiest when we’re crossing things off. If you’re like me you even add things to it that you’ve done just so you can cross things off. The problem is, we often focus on the piddly things in our lives instead of the big stuff. We change the cat box instead of filing our taxes. We go to the committee meeting instead of calling our son to discuss what’s on his mind. I’ve discovered the magic of a To-Don’t List. These are the must-do’s that boggle my mind that I don’t want to do. You know, you have your own list. What are you doing that doesn’t need doing? Where should your focus be instead? CHALLENGE: Just for today, let one must-do go. Good headlines aren’t hard. Questions make great headlines. See? Now take your product and write a few. Practice. Test what works. Then tweak it. PS. 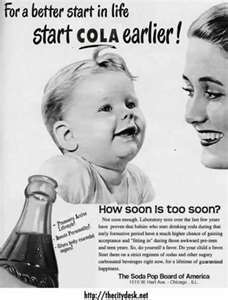 Can you believe they used to advertise feeding cola to babies? When we started our freefall descent into disaster, our debts totalled $2.4 million. We hadn’t even been counting because we were counting on the real estate cash flow carrying the debt effortlessly. It didn’t. There were massive real estate liabilities (i.e. mortgages owed to the tune of almost $1.8 million), credit card debts (primarily used to rehab the properties), personal debts (i.e. owed to family), medical bills and miscellaneous other debts. Both Dennis and I were self-employed and it was a 7-year run that simply wasn’t working. We were living in an $887,000 mansion and barely scraping by as we juggled the enormous debt. Dennis got up one morning and said I’m going to get a job. I got up the next morning and started selling off everything we owned. This included personal items and every property we owned, 14 in total. At this moment, almost 5 years later, we still owe $91,824 of the $2.4 million. Almost 96% of the way since we decided to turn around the Titanic. It’s been torturously painful, hideously humbling. We’ve been sued 3 times, once by my own Mother. We’ve declared bankruptcy and asked for a Voluntary Dismissal from the court and got it. We’ve gone without lights for 9 days. We’ve borrowed from our children. We’ve screamed, yelled and blamed each other. We’ve lived in our daughter’s guest room and basement. We’ve robbed from Peter to pay Paul. We’ve lost 4 duplexes to foreclosure. We’ve learned more in this last five year period than we did in the previous 45 years. We’re still together. Our covenant to each other is still intact. And this I know. You can make mistakes and still succeed. You can stumble and falter and still win. From the time I turned 25, all I ever heard financial planners talk about were finances. Everyone should have a retirement plan. Was I contributing to my 401K? What was my “nest egg” going to look like when I turned 65? Would Social Security still be around? What would my retirement benefits package look like? Why aren’t we more obsessed with figuring out life than we are in trying to figure out our money? Why aren’t we crazed with what inspires us, not what keeps us safe. I’ve had it with safe. Safe doesn’t work. There is no security, at least on this earth. You could be mugged walking down the street. You could die while lying in the cozy comfy safety of your own bed. Let’s give our obsession with finances a rest and start living! The goal of any business is to make a profit. Many of us have forgotten the primary mission of being in business and replaced it with our passion. Passion is fantastic if the kids have food on the table. Passion is amazing if you’re feeding the hungry. Passion belongs in every business, because the best businesses are fueled by passion. My question to you is, are you making any money? Because if the answer is no, then you’re doing it wrong. Money isn’t evil, the love of money is evil. I like money. I have boatloads of passion. But I’ve stopped to ask myself the question, are you making any money? Are you getting rewarded for the time, effort and energy you’re expending on your endeavor. If you’re not, then stop and redirect. Thanks for stopping by! Browse around...there's lots of fun and yes, even some really serious stuff on here.